Outlook Express offers a number of options for sending email. Select Tools, Options, and in the Options dialog box that appears, display the Send tab, shown in Figure 2. Figure 2. Outlook Express’s options for sending email. 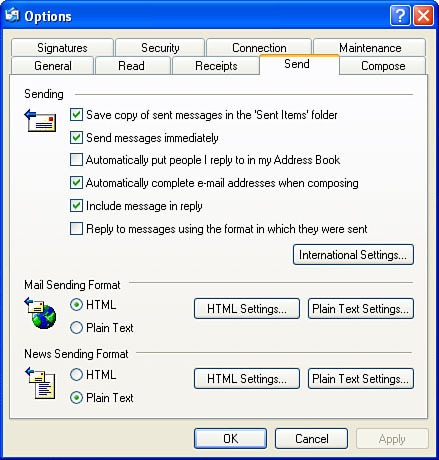 Save Copy of Sent Messages in the ‘Sent Items’ Folder When this check box is activated, Outlook Express saves a copy of each message you send in the Sent Items folder. It’s a good idea to leave this option checked because it gives you a record of the messages you send. Send Messages Immediately When this check box is activated, Outlook Express passes your message to the SMTP server as soon as you click the Send button. If you deactivate this option, clicking the Send button when composing a message only stores that message in the Outbox folder. This is useful if you have a number of messages to compose and you use a dial-up connection to the Internet. That is, you could compose all your messages offline and store them in the Outbox folder. You could then connect to the Internet and send all your messages at once. Automatically Put People I Reply to in My Address Book When this option is activated, each time you reply to a message Outlook Express takes the recipient’s name and email address and adds them to your Address Book. This only serves to clutter your Address Book with names you’ll never or rarely use, so I recommend deactivating this check box. Automatically Complete E-Mail Addresses When Composing When this check box is activated, Outlook Express monitors the email addresses you enter when composing a message. If you’ve entered a similar address before, the program will complete the rest of the address automatically. Include Message in Reply When this check box is activated, Outlook Express includes the original message text as part of the new message when you reply to or forward a message. This is a good idea because including the original message text serves as a reminder to the original author of what you’re responding to. Including the original message text in replies is useful, but you should rarely have to include the entire reply. It’s good email etiquette to delete unnecessary parts of the original message; keep only the text that applies directly to your response. Reply to Messages Using the Format in Which They Were Sent When this check box is activated, Outlook Express automatically selects either the HTML or Plain Text sending format depending on the format used in the original message. If you’d prefer to always use your default sending format, deactivate this check box. The Mail Sending Format group contains two options buttons that determine whether your messages contain formatting: HTML and Plain Text. 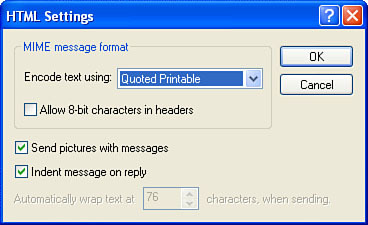 If you activate the HTML button, Outlook Express enables you to apply a number of formatting options to your messages. In effect, your message becomes a miniature web page and can be formatted in much the same way that a web page can. Note, however, that this formatting will be visible only to recipients who have an HTML-enabled mail client. Clicking the HTML Settings button beside the HTML option displays the HTML Settings dialog box, shown in Figure 3. Figure 3. Use this dialog box to work with settings associated with the HTML sending format. None—Tells Outlook Express not to encode the text. Base 64—Use this encoding if your message contains binary data. This encoding uses the Base64 alphabet, which is a set of 64 character/value pairs: A through Z is 0 through 25; a through z is 26 through 51; 0 through 9 is 52 through 61; + is 62 and / is 63. All other characters are ignored. Allow 8-Bit Characters in Headers When this check box is activated, characters that require eight bits—including ASCII 128 or higher, foreign character sets, and double-byte character sets—will be allowed within the message header without being encoded. If you leave this check box deactivated, these characters are encoded. Send Pictures with Messages When this check box is activated, any pictures embedded in the message or used as the message background will be sent along with the message text. 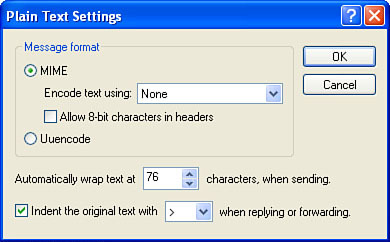 Indent Message on Reply When this check box is activated and you reply to a message, Outlook Express displays the original message indented below your reply. Automatically Wrap Text at X Characters, When Sending This spin box determines the point at which Outlook Express wraps text onto a new line. Many Internet systems can’t read lines longer than 80 characters, so you shouldn’t select a value higher than that. Note that the Quoted Printable and Base 64 encoding schemes require 76-character lines, so this option is available only if you select None in the Encode Text Using list. If you activate the Plain Text option instead, Outlook Express sends your message as regular text, without any formatting. Clicking the Plain Text Settings button displays the Plain Text Settings dialog box, shown in Figure 4. Figure 4. Use this dialog box to work with settings associated with the Plain Text sending format. MIME MIME stands for Multipurpose Internet Mail Extensions and it’s the standard encoding format for text-based messages. Each of the encoding options I discussed above is MIME-based. Uuencode This is an older encoding format that is primarily used when sending binary files to newsgroups. Indent the Original Text with > When Replying or Forwarding It’s standard on the Internet that original message text in a plain text reply be indicated with a greater than sign (>) at the beginning of each line. (Colons are also sometimes used.) When this check box is activated, Outlook Express prefaces each line of the original message with whatever character you specify in the list. If a message doesn’t require a response, file it or delete it. Note that by file it, I mean move it to some other folder. You should have folders set up for all major recipients, projects, customers, or categories that you deal with. If a message requires a response and you can answer it without further research or without taking a lot of time, answer it immediately and then either delete or file the message. If a message requires a response but you can’t send a reply right away, move the message to a folder designated for messages that require further action. You can then handle those messages later in the day when you have some time. Before moving the message to whatever you’ve designated as your “action items” folder, be sure to mark the message as unread. That way you’ll be able to see at a glance whether there are items in that folder and how many there are. Clean out your Deleted Items folder— This folder is a good safeguard to help you recover accidentally deleted messages. However, after a while it’s extremely unlikely that you’ll need to recover a message from this folder. Therefore, you should regularly delete messages from the Deleted Items folder. I recommend leaving the last two weeks’ worth of deleted messages and deleting everything older. Keep your spam filters up to date. Unfortunately, new spam messages appear every day. When you start to see repeats—the same message, the same subject line phrase, the same sender, and so on—update your filters to block the new messages. Look for Outlook Express patches and updates— Pay a visit to Windows Update to see whether Microsoft has released any security patches or updates for Outlook Express. Here, CLSID is a 32-digit class ID that Outlook Express generated for your default Outlook Express identity. You should include the contents of this folder in your backups and run those backups regularly. Back up your accounts— If you have multiple accounts, re-creating them on a new system or in the event of a crash can be a lot of work. To lessen the drudgery, make backups of your accounts by saving them to Internet Account Files (.iaf extension). In Outlook Express, select Tools, Accounts and then display the Mail tab. Select an account and then click Export. In the Export Internet Account dialog box, choose a location and then click Save. Note that you can also do this with News and Directory Service accounts. Here you’ll find subkeys for each of your Outlook Express accounts (usually named 00000001, 00000002, and so on). Again, CLSID is your 32-digit identity number for Outlook Express. Regularly export this key to save this important Outlook Express data. Compact your folders— When you move or delete messages, Outlook Express removes the corresponding data from the corresponding message store (.dbx file). This results in gaps within the file. 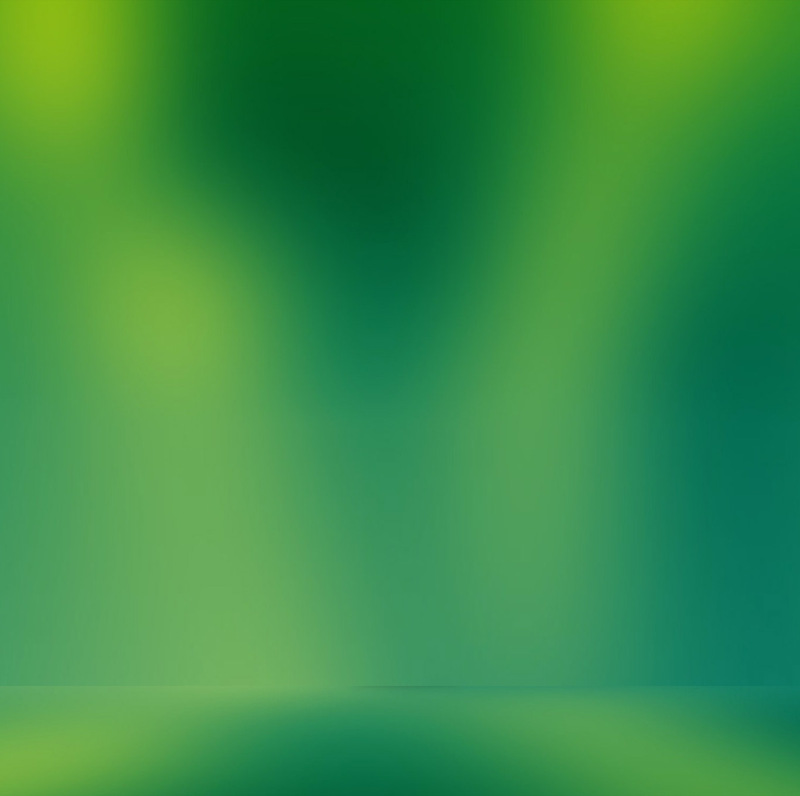 To remove these gaps and reduce the size of the file, you need to compact the folder. To do this, select the folder in Outlook Express and then select File, Folder, Compact. If you’ve been moving and deleting messages from a number of folders, you can get Outlook Express to compact all your folders in one pass by selecting the File, Folder, Compact All Folders command.